One of the main incentives to hold a meeting with Hurtigruten at sea is the wonderful surroundings – great for generating new, innovative ideas. Many conference guests also take the opportunity to join some of the exciting excursions that are available on route. Hurtigruten can offer high standard conference rooms for up to 200 people, comfortable panorama lounges and a restaurant. The ships also have internet access and there is generally good coverage for mobile phones. The cabins on board are comfortable and all have a shower/toilet and a sofa/berths.Suites and mini suites are also available. From May to the end of June, you will experience the midnight sun in Northern Norway. From November to the end of January, the Polar night offers ample chances of seeing the northern lights. Joining a Hurtigruten voyage could not be easier. You can start your journey from any port on the way, so you can fly to Bergen, Ålesund, Trondheim, Tromsø or Kirkenes and join the cruise from there. Hurtigruten is often referred to as 'the world's most beautiful voyage'. 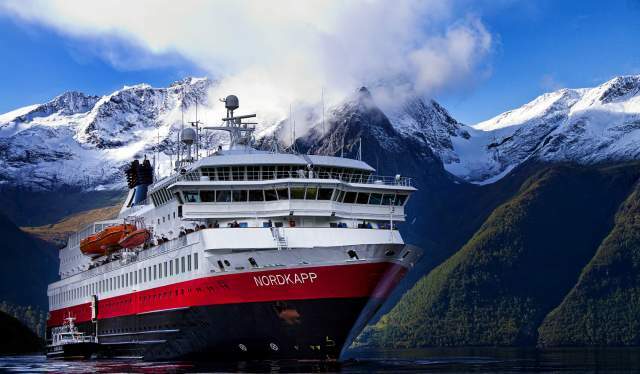 The Hurtigruten fleet has 13 ships with daily departures and more than 120 years of maritime experience. The first Hurtigruten voyage departed Trondheim for Hammerfest, via 11 ports, in 1893. In 1898, the Hurtigruten route expands southward to include Bergen, with three departures a week. Kirkenes near the Russian border became the northern turning point of the Hurtigruten voyage in 1908. A new era began in 1993 with the modernisation of the fleet. By the end of 2007, 10 new ships had been added to the fleet. 2013: Hurtigruten celebrates its 120th birthday. For more than a century, its passenger and cargo ships have connected the northern and southern parts of Norway.